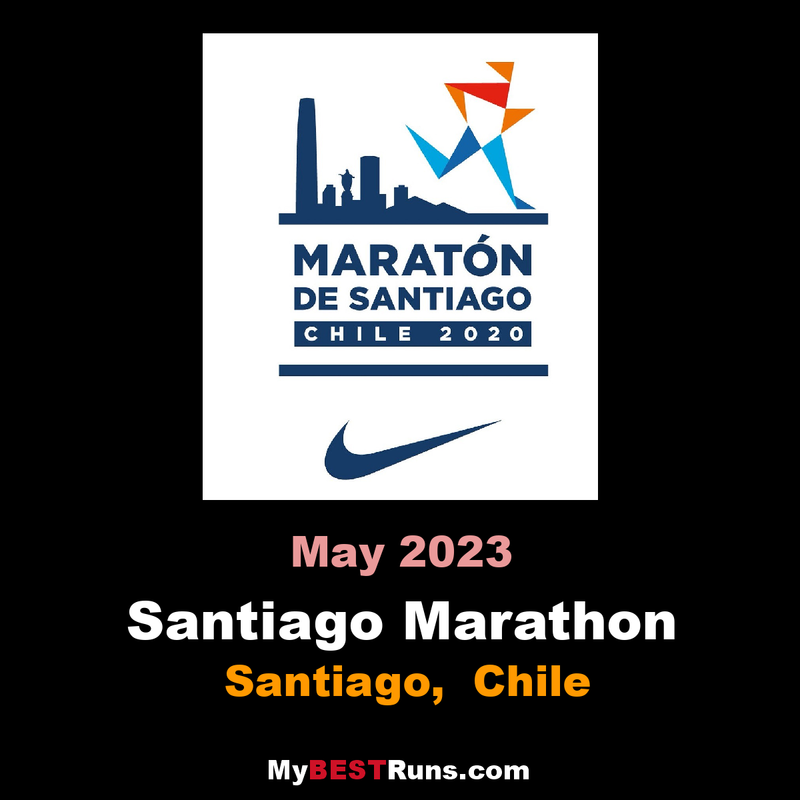 The Santiago Marathon is an annual event first run in 2007 through the streets of Santiago Chile. The marathon has a Bronze Label from the IAAF. Other races include a half marathon and a 10K run. Is the largest sporting party in Chile, had its first version and 6,800 official entries were called. Thanks to the work and perseverance of a team composed of highly trained professionals, from Adidas as main sponsor and Prokart in production, including distances of 10, 21 and 42k, plus the definition of a representative circuit of the most important places in Santiago . To this is added the sponsorship of the National Institute of Sports and the Collaboration of the Regional Government and the Metropolitan Intendancy in matters of security, thinking of the high number of participants. The Marathon is seen throughout Chile, 2011 marked the completion of the first television broadcast of the event, an achievement that took the MDS live and live across the country for four hours through the screens of Channel 13. The broadcast marked a historical tune for a Sunday in that schedule with a peak of 11.8 rating points, setting a precedent of the scope of competition in mass media. Already consolidated in sports, the 2011 Marathon was the moment to advance in important aspects such as Social Responsibility. There was a technological leap represented by the neutralization of CO2 emissions, caused by the use of public transport (Metro), generators, vehicles and other production equipment; the elimination of the use of paper in the registration and accreditation systems; and the use of hybrid cars and natural gas trucks. 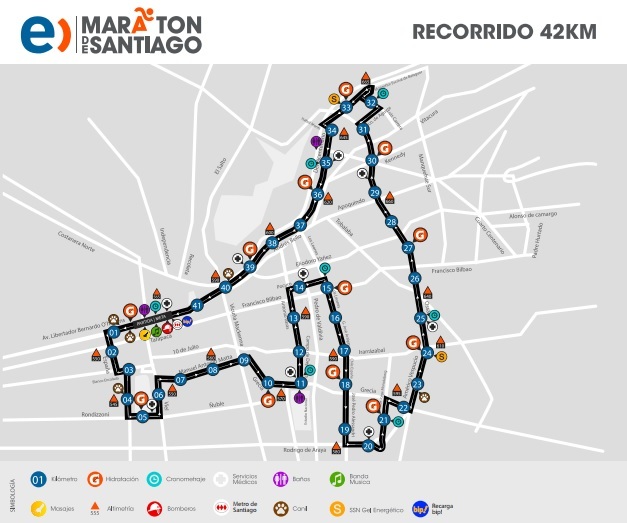 Thus, the MDS became the first Marathon in the world to manage these advances in harmony with the environment, with the city of Santiago and its inhabitants. It would not be the only time, since all these aspects were deepened in the following editions. The 2012 version represented the confirmation of the sustained growth it had had in terms of foreigners enrolled in the call. Coming from more than fifty countries and five continents, this edition reached a record number of more than 3,000 foreign athletes, motivated by the conditions of the event that were transforming it into a perfect scenario as a selective classification to the championships and international distance tournaments . The best example of the above was the classification of the national athlete, Natalia Romero, to the London 2012 Olympic Games, with a time of 2:34:57. With these conditions, the event was recognized by the IAAF with the Bronze category for its next version, as well as its incorporation into the international calendar of athletic competitions. The 2009 edition once again exceeded the most optimistic expectations. Of the more than 16 thousand registered, 1,263 ran the full distance of the Marathon, 5,558 the Half Marathon and 8,969 the Run of 10k, in a day whose effective participation was estimated at more than 22 thousand people. 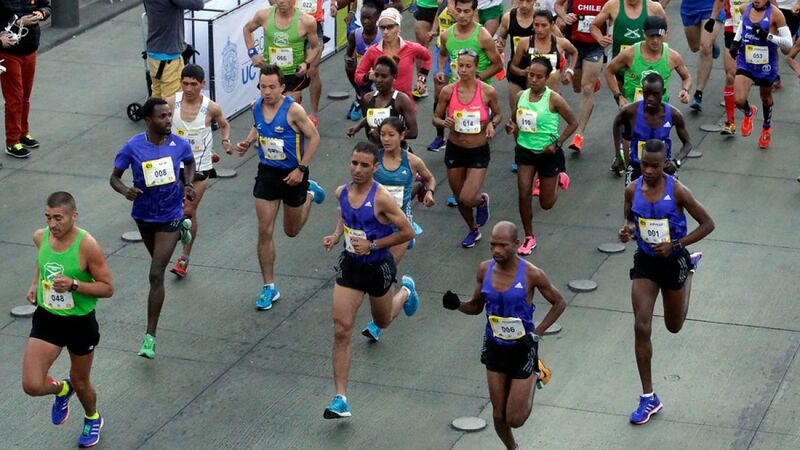 An important milestone of this edition was the mark of Erika Olivera, who won the women's category with a time of 2:36:19, which allowed her to qualify for the World Athletics Championships in Berlin. Given the explosive growth of the race, the organization again increased the number of registrations in 2010. A special year, since in addition to having the historical and symbolic incentive of the Bicentennial of the country, the population was moved by the catastrophe of the earthquake of 27 / F. The Marathon of Santiago was proposed as a gesture of unity and solidarity to raise the nation and its people affected by the natural disaster. The response was effusive and more than 25 thousand athletes from all regions of the country and abroad gathered in front of the Government Palace. They witnessed the deployment of the largest human flag that has been known in Chile and the milestone of over 2,600 registered for the distance of 42k. 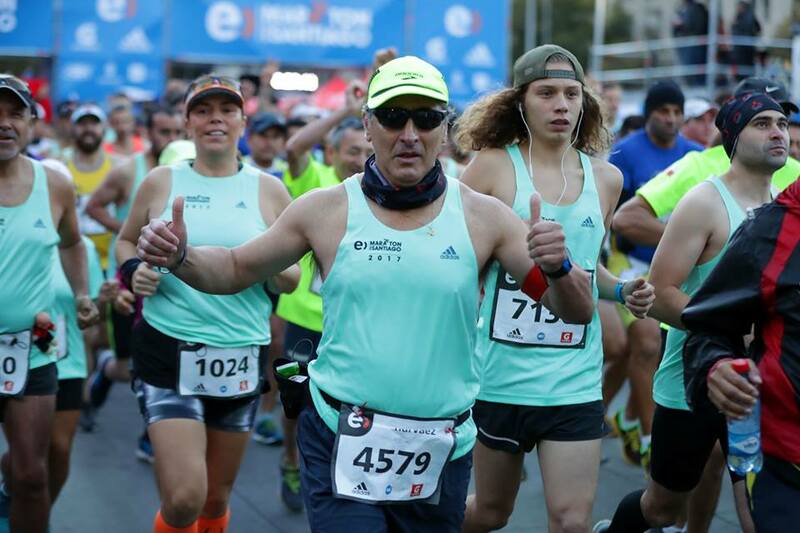 For the Entel Marathon of Santiago 2015, the MDS Corporation presented a new project that sought to detect runners between 15 and 18 years old to make their debut in the 10k. The objective of this initiative is to promote running and seek the talent of young athletes, and in an initial stage was held in four of the municipalities that cross the event: Santiago, Providencia, La Reina and Las Condes. The plan was carried out by the YKA club, led by Erika Olivera, and the training was carried out in the facilities of O'Higgins Park, Inés de Suárez, and Parque Araucano. Participation was free with the idea of maintaining this initiative over time. 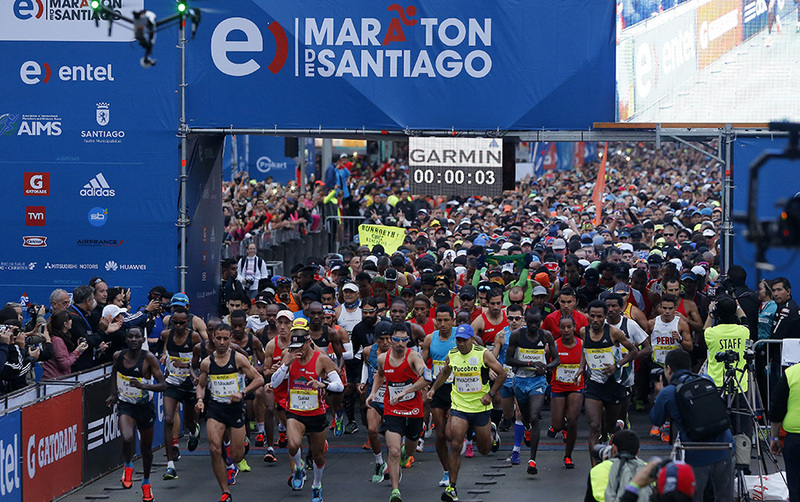 For the first year, in 2015, the Santiago Marathon Corporation and UNICEF Chile signed a cooperation agreement that allowed the international body to benefit from the ninth edition of the largest sporting event in Chile, in which 28,000 runners registered for the first time.The agreement consisted in that the participants of the Entel Marathon of Santiago 2015, at the time of registration, could make a donation or become partners of UNICEF Chile during the withdrawal of the kits at ExpoRunning 2015, a three-day activity that precedes the competition . Of the total number of participants in the competition, 4,543 participants decided to make a contribution to the international organization, which totaled an amount of $ 8,469,312. These funds are intended to help UNICEF continue working to ensure compliance with the rights of children and adolescents living in Chile.